The Forest Therapy Association of the Americas is a network of nature sites which are ecologically diverse and committed to improving the health of forests and humans. Please see our list of sites below or contact us if you are interested in joining FTAA. We are looking for partner organizations to be part of our growing network. If you have available land for use a forest therapy center, please let us know by emailing: info@forest-therapy.net. A 72 acre site with organic gardens and retreat facilities, the SunDo Healing Arts Center is the ideal place for a forest therapy visit. The forest trail meanders its way through lush deciduous and coniferous forest, eventually connecting to apath through open grass and flower fields. Culminating at the top of the retreat center's summit, this path offers beautiful views of the surrounding hills and the evening sunset. 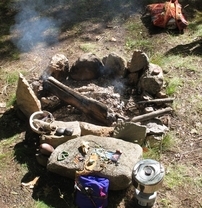 A 17 Acre site at the foot hills of the White Mountains, the Nature Healing Retreat Center offers wilderness quests for deep experiential knowing of the Self. These retreats teach relationship, ... relationship with one's own self, with others, and with nature to connect more fully to a universal family in the Circle of Life. The land responds to individual needs with amazing love, wisdom and gentleness towards all who join with it.